It was announced Saturday afternoon, that Tracy McGrady is set to be inducted into the 2017 Naismith Hall of Fame. Tracy McGrady was drafted 9th overall in the 1997 NBA Draft by the Toronto Raptors. He was great for the Raptors through three seasons, where he put on dunk clinics and high scoring performances. Alongside his distant cousin, Vince Carter, McGrady lead the Raptors to their first playoff clinching season in franchise history in 2000. However, the Raptors were swept by the New York Knicks in the first round. Following three seasons in Toronto, McGrady became a free agent and sought after a starting position, ending up on the Orlando Magic. After newly free agent Grant Hill went down with injury, the team was turned over to McGrady. That season he went on to become a top-5 talent in the league, averaging: 26.8 points, 7.5 rebounds, 4.6 assists, 1.5 steals AND 1.5 blocks per game. A force on both ends of the ball, his immense presence on the court earned his first NBA All Star appearance, and the Most Improved Player award. That season and the next, the Magic would be swept in the first round of the playoffs. The 2002-2003 season was great for McGrady. Continuing his uphill incline, he earned his first scoring title, after averaging 32.1 points on the season. In the playoffs, the Raptors (not the Warriors) blew a 3-1 lead over the Detroit Pistons, losing in Game 7. The following season, Tracy would go on to win a consecutive scoring title (28.0 ppg), but the Magic held the worst record in the East and did not make it to the playoffs. Rumored to have a grudge with the GM in Orlando, it was no surprise to fans when he was traded to the Houston Rockets. McGrady was great in Houston right off the bat, paired up with 7″6 big man Yao Ming. That first season with the Rockets would solidify McGrady’s name in history, as he went on to score 13 points in the final 35 seconds of a game against the San Antonio Spurs to win the game. That performance to this day is still recognized as one of the best in history. 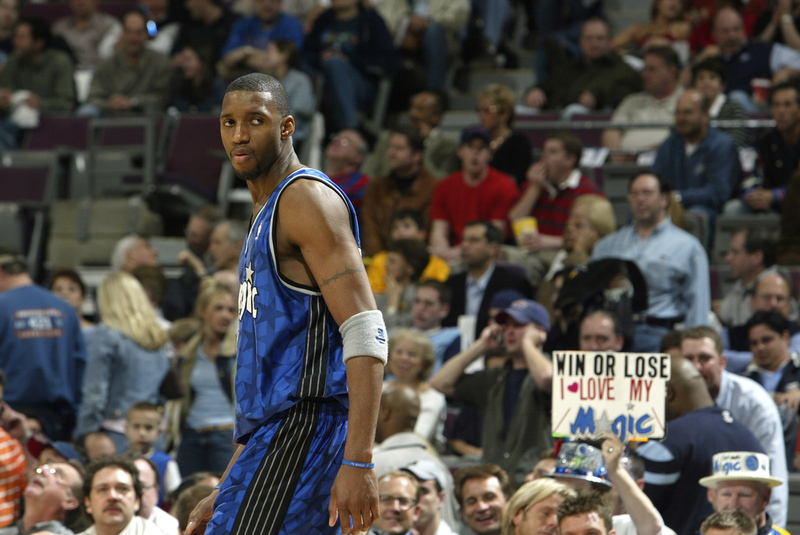 In 2005, McGrady began experiencing issues with back spasms, and they plagued nearly the next two years of his career. After missing the first 7 games of the 2006 season, Tracy returned to the top of the league after the Rockets lost Yao Ming to injury. Despite his game play, he could not lead his team past the Utah Jazz, who would knock Houston out of the playoffs in both of the next two post seasons. Ironically enough, McGrady made it past the first round of the playoffs while riding the bench. The Rockets defeated the Portland Trailblazers in the first round of the 2009 playoffs, as Tracy was missing that season with a knee injury. The final years of his career were not stationary. In 2010 he was dealt to the Knicks where he would finish that season averaging just 9 points a game. McGrady would go on to sign a one-year deal with the Pistons, where he averaged an even lesser 8 points a game. In 2011, McGrady signed a deal for the veteran’s minimum with the Atlanta Hawks, where he played 52 games and averaged just over 5 points. As most players do, he went on to play Chinese basketball but his NBA career wasn’t over yet. The San Antonio Spurs, looking to add depth for their run at the NBA Finals in 2013, signed Tracy McGrady at the culmination of the regular season. His first and only time playing in an NBA Finals, McGrady averaged just 1.3 rebounds and 1.2 assists that post season with the Spurs. Tracy McGrady won two scoring titles in 2003 and 2004, and averaged: 19.6 points, 5.6 rebounds, and 4.4 assists over his career of 15 seasons. All information provided by ESPN, NBA.com, and the Orlando Sentinel. Featured image provided by Zimbio.